Duke Brakes carries a wide variety of solenoid brakes including brands such as Gemco, Stearns, Johnson, and more. 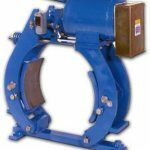 Designed for demanding applications such as mechanical handling equipment, cranes, winches, stacker reclaimers, ski lifts and conveyers, our solenoid brakes are known for their reliability while providing extended, trouble free service. Whether you need a new braking kit, specific replacement parts or service, Duke Brakes has what it takes. Please view our product listing below or contact us for more information.